My name is Vivien Barbier and I’m one of the Zidisha’s current client relationship interns for Kenya. Today I visited Samuel and his business. 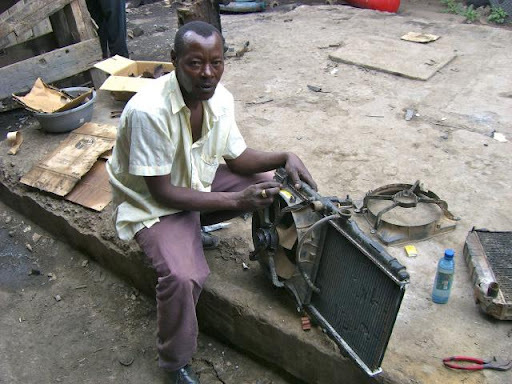 The loan helped Samuel to increase the profitability of his business. With the money he was able to buy more spare parts, so that he can repair radiator and fan more quickly. Samuel told me that Zidisha helped him a lot and that he should be able to repay the loan before what is scheduled. Samuel has three children, two of them are going to public school and the first one recently finished Elementary school and is trying to go to college. The college education is not free so Samuel is trying to earn enough money to allow is first born to study. I hope that his business will continue to grow so that he can make sure all his children can have a good education. I’m convinced that Samuel will manage to do it. His business seems to be working well and Samuel had a lot of work to do when I visited him.